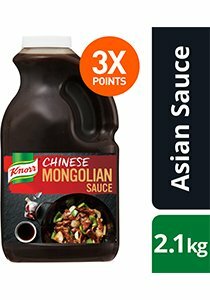 Made with garlic, chilli and soy sauce, pairs well with poultry, beef, lamb or seafood noodles and stir fries, or to add an Asian twist to pizzas, dipping sauces and gourmet pies. Sauce for noodles, pizza, gourmet pies, dipping sauce, braised dishes, stir fry. To ensure a gluten-free meal, avoid cross-contamination with gluten during preparation. Sauces are easy to use as no preparation is required and no ingredients to add. Saves time and provides cost and portion control. Perfect for low skilled kitchens or for Chefs who don’t have time to cook from scratch. Ideal for Chefs who want to add their own creativity. A flavour to suit every menu and taste. Consistent quality and taste every time. Bain-marie stable, perfect for long service. Freeze thaw stable. Re-sealable jug. Store in a cool, dry place. After opening, store refrigerated for up to 5 days or freeze.